This article is a preview from the upcoming Issue #5 of the Rafflesian Times, slated for release this week. The signs of celebration are everywhere this year – from the SG50 Celebration Fund, to the familiar SG50 posters adorning our buildings and buses. For some, however, Singapore’s jubilee year celebrations may raise more perplexing questions rather than exude the pride and confidence a nation needs to bolster its national identity. ‘One of the reasons Singaporeans continue to be anxious after 50 years of existence is because our national identity is a utilitarian one based on functionalism. Nothing is sacred to us. The most important question we ask is – does it work?’ This was one of the insights that Dr Terence Chong shared with us when questioned on the important implications of globalization on Singapore’s national identity. The question he raises is a salient one. National identity is not sufficiently entrenched in Singapore’s society for us to celebrate it with complete self-assuredness and without question. At a time when more people are becoming Singaporean rather than being born Singaporean, the matter of how to define our rather nebulous identity has become more pressing than ever. And for the increasing minority of foreigners who are either new to or familiar with our country, how exactly do they establish this sense of ‘Singaporean-ness’? The implementation of these pragmatic ideals has seen renowned success in our country, even becoming a source of pride for most Singaporeans. It therefore comes as no surprise that the increasingly foreign makeup of our society has grounds in this pragmatism that has been so central to Singapore, beginning with the motives of the immigrants themselves. 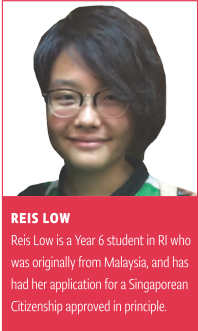 Reis Low (15S07B) cites the ease of travelling and applying for visas that accompanies Singaporean citizenship as one of her family’s primary motivations for immigration, perhaps one of the pragmatic concerns that Singaporeans often take for granted. ‘Apart from my hopes for going to overseas universities which equates to applying for visas, my mother travels a lot for her work and it would be much easier with Singaporean citizenship to do so,’ she explains. In daily life, we come into contact with a plethora of cultural symbols and institutions that promote a fundamental sense of belonging. A naturally-derived sense of belonging plays an indispensable role in forging the emotional bonds between individual and homeland, and this role cannot simply be replaced by the official, government-controlled ideals of what being Singaporean should mean. For instance, food has become more than a means of sustenance for many locals, becoming almost a national obsession. Similarly, social norms like speaking Singlish have been established in Singaporean culture as trademarks of our identity. Speak Singlish to any seasoned Singaporean and you will be understood. Singlish, as Ms. Yu-mei Balasingamchow (RGS,1990; RJC 1992) puts it, ‘comes naturally to your tongue when you talk to your own people […] whether you’re in Singapore or abroad’. Additionally, as much as language unifies, it can simultaneously lead to a sense of estrangement. For Blazer Challander (15S06G), who lived in the USA for 3 years before returning to Singapore, language plays a huge part in his integration. Despite being Singaporean, he feels different from his peers because of his American accent and admits to ‘trying to fit in sometimes by not sounding so American’. Clearly, the endearing icons of Singapore culture are simply not enough to create the sort of deep-rooted sense of identity we see in countries with long-established traditions and norms that assimilates immigrants and preserves their shared heritage. For many countries, what ties their people together is their shared history and culture. To our interviewee who was originally from China, Singapore has not ‘formed such a distinct sense of identity yet, as compared to the sense of identity in China’. The Chinese build their identity on their millennia-long and illustrious history; the Americans on their independence struggle and the ideals of the American Dream. Some Singaporeans however, seem to be able to freely relinquish their national identities, as the people behind Neurotic Ramblings of a Singaporean Couple (NRSC) have. Shawn Ang (RJC, 2003) from NRSC testifies that ‘We can’t renounce citizenship yet, but for all intents and purposes we don’t identify as Singaporean.’ The ease with which many like him can give up their Singaporean identities is a disturbing trend, one which can be attributed to Singapore’s relative lack of a strong sense of history and culture, which is what binds people to their home countries. Singapore does not seem to have that. After all, our official history dates back only 50 years, or to the colonial period. Unlike our neighbours Indonesia and Vietnam, we do not have an armed conflict in our struggle for independence to pull us together, and our people come from many places around the world, with no homogenous religion or culture. Ms Claire Leow points out that ‘to be Singaporean is to acknowledge our immigrant roots’. But such a patchwork identity is harder to grasp than say that of a Japanese or a Thai identity, where nationality is clearly tied to a single ethnicity; or even if we looked to American identity, that is dazzlingly multicultural, it has had a longer time-frame to gestate and cohere. Singaporeans often struggle to find an identity that we can reconcile, given our relatively short history. Natasha puts it well when she notes now ‘that sense of nationalism is not active amongst Singaporeans, so I don’t really feel an active instinct to express my pride on a daily basis’. Of course, national identity is not solely a matter of flamboyantly proclaiming one’s love for one’s country, but that many of us feel the same way is telling of our difficulties, as a country, in finding our identity through pride for our history and culture. Yes, our multi-ethnic social fabric is something to be proud of, but it can also hinder our attempts to define an identity based on shared history and culture, especially given the wave of immigration Singapore has had in the past decade. Amidst the resultant insecurity surrounding the basis of our national identity, the government’s attempts to construct the official narrative of this identity has become seemingly necessary. There are significant problems associated with trying to construct a national identity through the top-down approach we currently employ to target immigrants, which weakly attempts to cater to a wide demographic with the same facile methods. Most prominently, the government only recently implemented the Singapore Citizenship Journey (SCJ) for new citizens, the effectiveness and even necessity of which has been called into question. Seeing that applying for citizenship requires a minimum Permanent Residence of 2 years, it is unsurprising that the SCJ has been received with a mix of exasperation and bewilderment by most of the parties subject to it. It’s clear that most people that apply for citizenship are not as ‘foreign’ as we seem to perceive and treat them. They can be people who have spent their childhoods here and grown up in the same education system, or at least lived in Singapore for a few years. Although not necessarily cynical in nature, many in the country do hold sentiments towards SG50 that understandably fall short of undying patriotism. 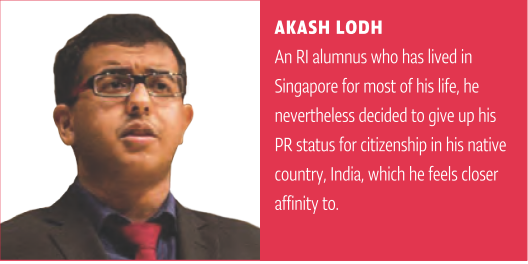 As Akash puts it, ‘I think the fact that the government has to intervene a lot in terms of building up a stronger national identity is telling of the fact that the pride here is not as organic.’ The reality is that integration has never been entirely successful in our country, no matter how strongly we may preach multiculturalism and boast of inclusivity. It may surprise some of us that racial stigma still exists in Singapore; after all, we are arguably renowned for our racial and religious inclusivity – at least on paper. In practice, the ‘CMIO’ (Chinese, Malay, Indian, Other) framework has done more harm than good in facilitating societal integration, by rigidly demarcating the percentages of each race category making up our society. As Yu Mei explains, the rigidity of the CMIO paradigm eventually leads to the alienation of foreigners, no matter how familiar they may be with Singaporean culture and norms. Others, however, are able to integrate eventually despite the initial challenges involved. For instance, Blazer says that he feels more Singaporean than American because he was born here, and has been studying in RI for over 3 years. Overall, we’re still far from perfect – a fragmented society that finds it difficult to rally the explicit, collective pride befitting of a jubilee year celebration. Perhaps we have succeeded in integrating people from different cultures into our economy by providing them equal opportunities at work, in school, and so on. But there is still a long way to go before we can genuinely claim to hold solidarity with all Singaporeans across all backgrounds. As Singapore meets its 50th year of existence, it also meets the rising insecurity of its local people, whether citizens or permanent residents, in establishing a coherent national identity. While it is relatively easy to attain a sense of belonging through the various institutes, activities and symbols that make up Singaporean culture, being accepted as Singaporean is a very different matter, and one that many still struggle with. With the tenuous sense of identity we currently hold, perhaps it is more appropriate to strengthen this by increasing our accommodation towards those we once perceived as ‘foreign’ to us, rather than needlessly amplify the sense of estrangement that afflicts these people on a daily basis. Especially since identity has become a highly fluid and abstract concept in today’s world, who is to say that you cannot be a true Singaporean without having a Singaporean citizenship? We are Singapore, but who are ‘We’?